I am going to sprinkle these with cardamom sugar and bake in a low oven.. see the results on my next cake.. Here is the book to accompany the Sweets Made Simple series by Hope & Greenwood. I can’t wait to eat more sweets that I already do! I also obviously bought Jamie Oliver’s new book, because who does’t love Jamie..? Have I mentioned Autumn recently? To make fruit and veg crisps, slice your fruit thinly, sprinkle with a spiced sugar and bake in a low oven for a few hours. Easy way to add height to cake! 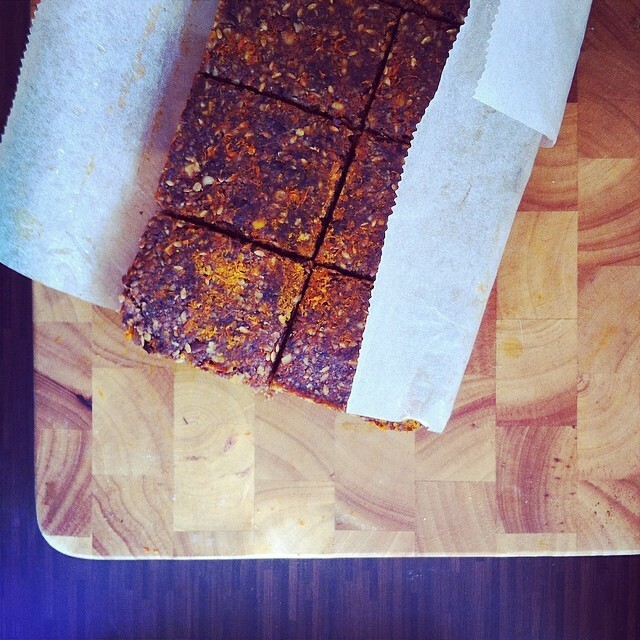 I have finally done it, perfected my recipe for the #dairyfree #glutenfree boost bars, excellent for post work out. The recipe started out as a FAB granola type boost bar but when my boyfriends mum required a #dairyfree #glutenfree and almost #sugarfree version that would hold together (unlike like a normal flapjack) WELL I had to get my experimenting cap on. I think we have finally cracked it, the secret being a high fruit content.